Well, the last vintage column covered vintage tea time so I needed to move onto something a bit stronger. After tea time, the next step is obviously cocktails. And I'm only being semi-flippant. 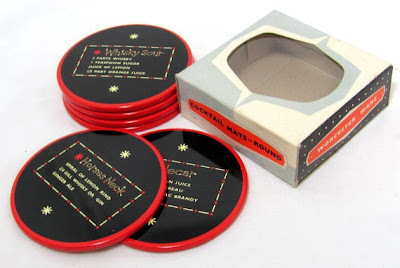 The concept of cocktailing developed in the late 1920s, as a social occasion that occurred between 6pm and 8pm, with a wardrobe to match - basically a glitzier version of daywear. 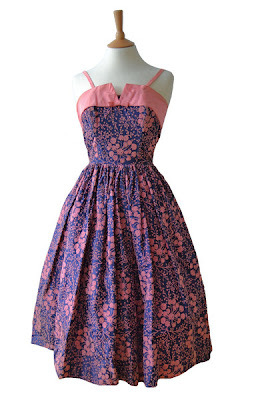 However, it wasn't until the 1940s Christian Dior named the "cocktail dress", and basically opened the floodgates to commercialisation of cocktails - they were used to sell everything, from dream dresses to bar paraphernalia. Vintage lovers, that means your rather tipsy ship has come in. Let's start with the dresses. Natasha Bailie is selling the amazing 50s flock cocktail dress shown above, which comes complete with a wrap. With a boned bodice, and selling for £90, it's pretty much a perfect dress. Until you realise you need a 24 inch waist to wear it. Eeek - not too much room for your cocktails there. 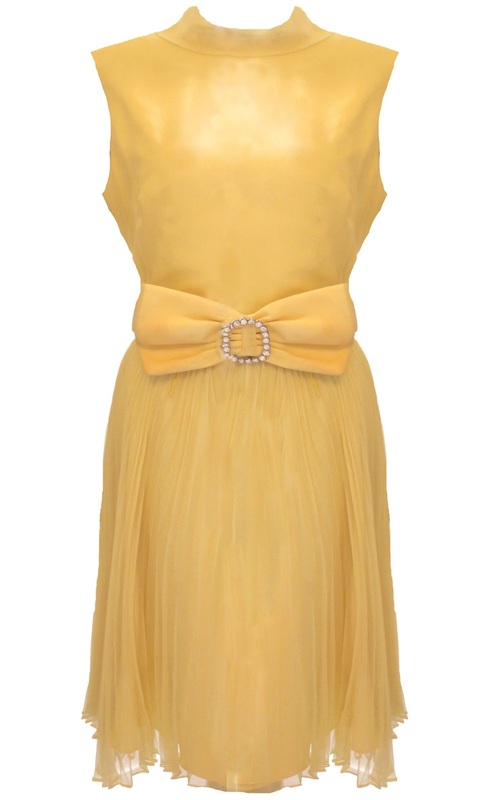 More forgiving on modern figures will be this size 14 terrific lemon yellow 1960s dress, from It's Vintage Darling. Check out that rhinestone belt, which goes some way towards justifying the £95 price tag. Although the 1950s and 60s are considered the golden age of cocktail dressing, there are fabulous dresses available from later eras too: how about this 80s strapless number for more yellow, or this slinky blue 70s number? You're looking brilliant. What next? Well, all the best vintage homes have a well-stocked cocktail cabinet in a corner somewhere. Retroworld always have a good selection of these up on eBay. This design, complete with working light, is £199 to give an idea of prices. But you could probably pick up all the bits and make yourself a nice little cocktail corner without spending a fortune (look at Elsie's cocktail cart make-over on A Beautiful Mess for inspiration). When you're making cocktails - or fitting out a cocktail bar - a key question is if you want to go kitsch or classy with your decoration. 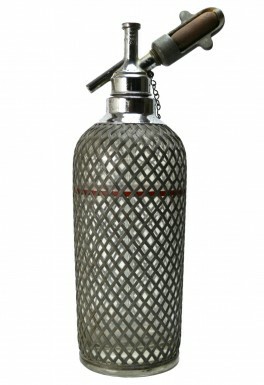 If it's the latter, pay a visit to Lavish Shoestring: they've got a wonderful Art Deco cocktail shaker and the soda syphon bottle pictured (£75) in stock at the moment. Pineapple Retro are selling a brass pineapple ice bucket - the classiest kind of pineapple ice bucket you can get - which wouldn't look out of place at Graham & Green. If you would prefer to go kitsch, Pineapple Retro can help you there too. How about an orange-shaped ice bucket or rainbow shot glasses on a stand maybe? H is For Home have plenty of this kind of thing as well - from the slightly bonkers "Mr Cocktail" bar kit to this hedgehog-shaped cocktail stick holder, which can be yours for £20. 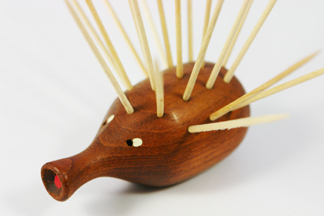 I've seen loads of these little wooden cocktails creatures while doing my research, including owls, mice and fish. Drinks need nibbles like a martini needs an olive or lemon peel. 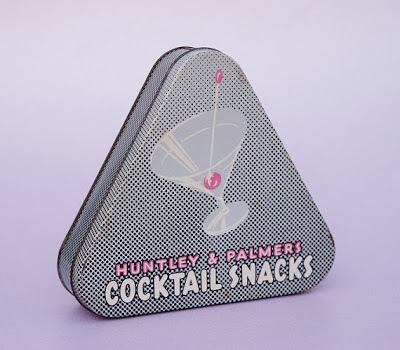 I want all my nibbles to be served in something as vintage glamorous as this cocktail snacks tin. It's yours (empty, sadly) for £12.99 from Oh Hazel Vintage on Etsy. How brilliant is this fabric?! 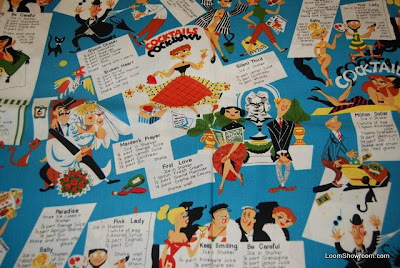 Cocktail recipes and a little bit of social commentary - perfect. I found it in the States, at Loom textiles, but you can bet your last dollar I'll be keeping my eyes peeled for something similar on sale in the UK. That's trusting I'll be able to see anything after all these cocktails, of course. Oh my goodness, I absolutely NEED a vintage cocktail cabinet to make my life complete. I've been thinking this for a while, but this post is confirmation that cocktail hour rules! It really does! I don't have the space to devote to a cabinet but I'm definitely on the look out for a drinks trolley of some kind (plus has the advantage you don't need to move to get the booze...!). We'll always go with the size listed on the website. They'll say if they think the sizing is out, and we'll always pass that information on!